I began the day by wondering about the origins of Mother’s Day as is celebrated in Australia. In England (where I was born) it is Mothering Sunday – 4th Sunday in Lent, so it is basically a Christian celebration, whereas Mother’s Day is just a celebration and is on a different day. Anyway, I was taken for breakfast as a surprise (read shock, I have my Sunday hair on!). 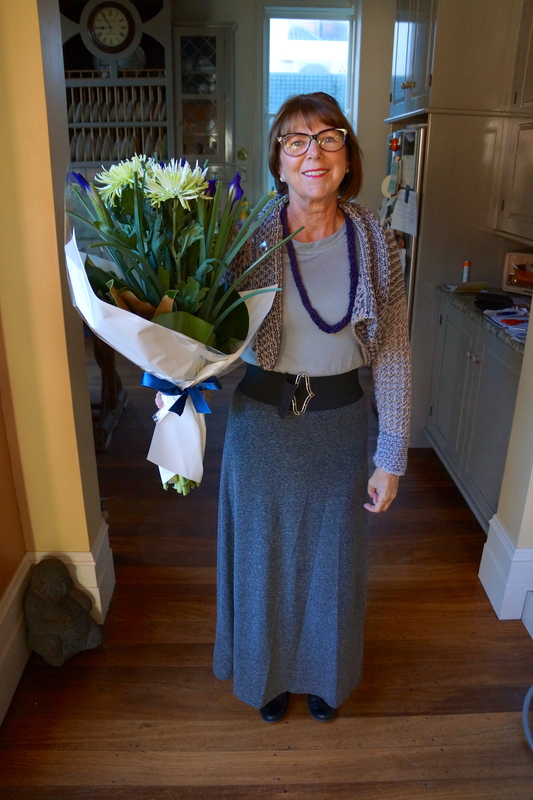 First I was presented with a massive bunch of flowers, nearly as big as me. Gorgeous. Archie made me laugh when he told me that he hurried up to Lizzie Bee in Dalkeith and queued with all the other slack kids who had not pre-ordered their flowers. The florist rose to the occasion and his choice matched my MMM outfit really well, totally coincidentally though. I am wearing a hand knitted necklace called “Coffee with Ron”, the kit (pattern and yarn) won as a door prize at last year’s Quilt and Craft Fair, donated by Dairings. I am also wearing the Susan top, hand-made belt and Origami Cardigan (how many of my garments are labelled origami?) yarn and pattern by Jo Sharp. 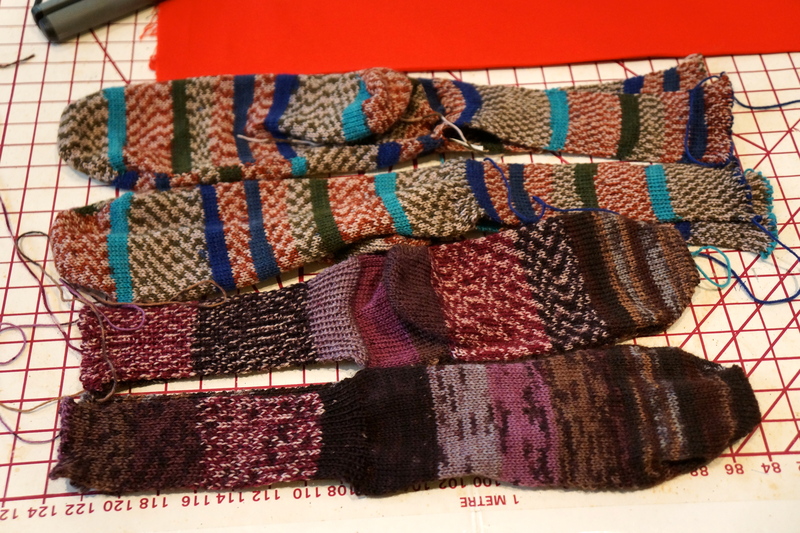 I also have the inevitable, but hidden, machine knitted socks. The family took me for breakfast to the Gordon Street Garage. For non-Perth people, this is no longer a garage (it was a chop shop apparently), but is now a trendy eatery. It is a great spot. 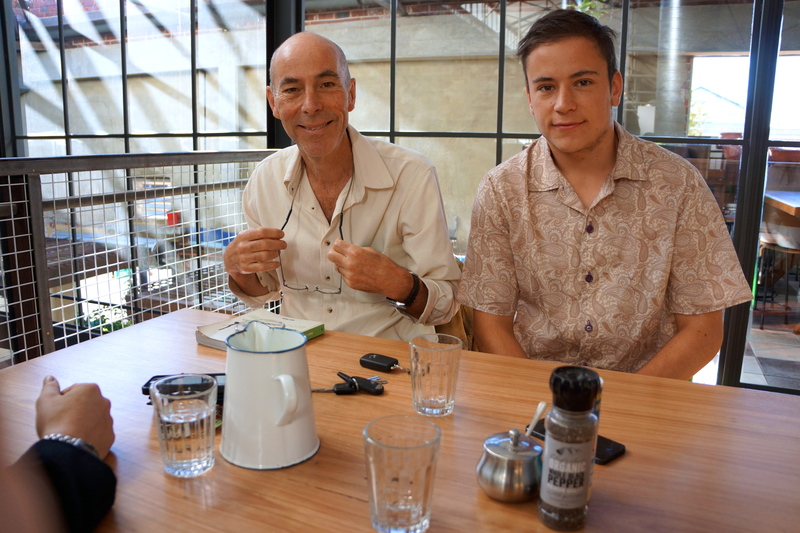 Mark and Archie wore shirts made by moi – I don’t think this was deliberate, Archie wears his shirts constantly. Mark’s is the silk and linen Kwik Sew 3422 and Archie has my old favourite Vogue 8800 in a paisley print cotton. Tom has yet to experience one of my shirts (except for the fleece one), so was in a bought (gasp!) shirt. 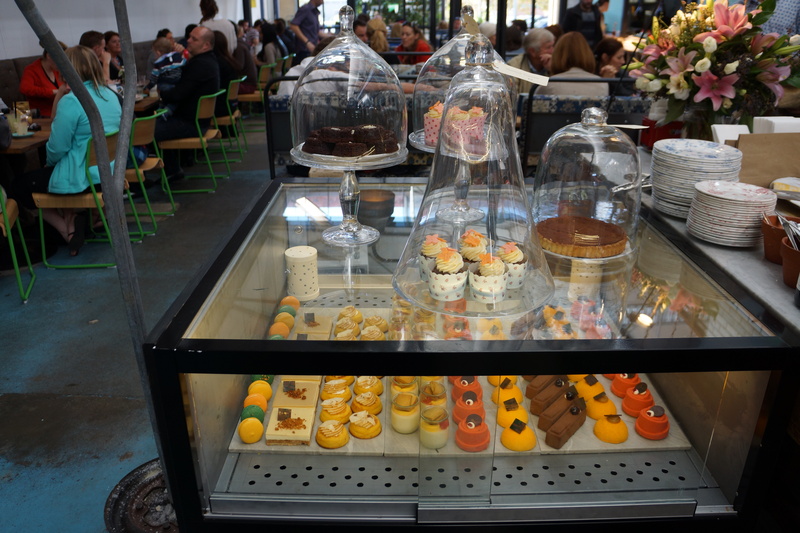 Breakfast was delicious, but I was sorely tempted to hang around for morning tea when I spied the cake display! My mother loved the bag I made for her (blogged here), especially as I filled it with chocolate! 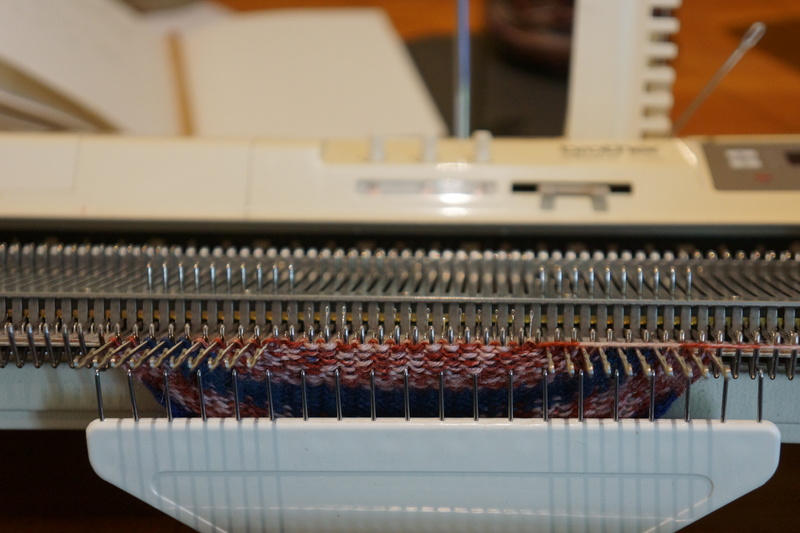 I have been hanging out to knit socks, but the sponge bar on the knitting machine was kaput. A new sponge was ordered and duly arrived, so Mark glued it to the sponge bar. 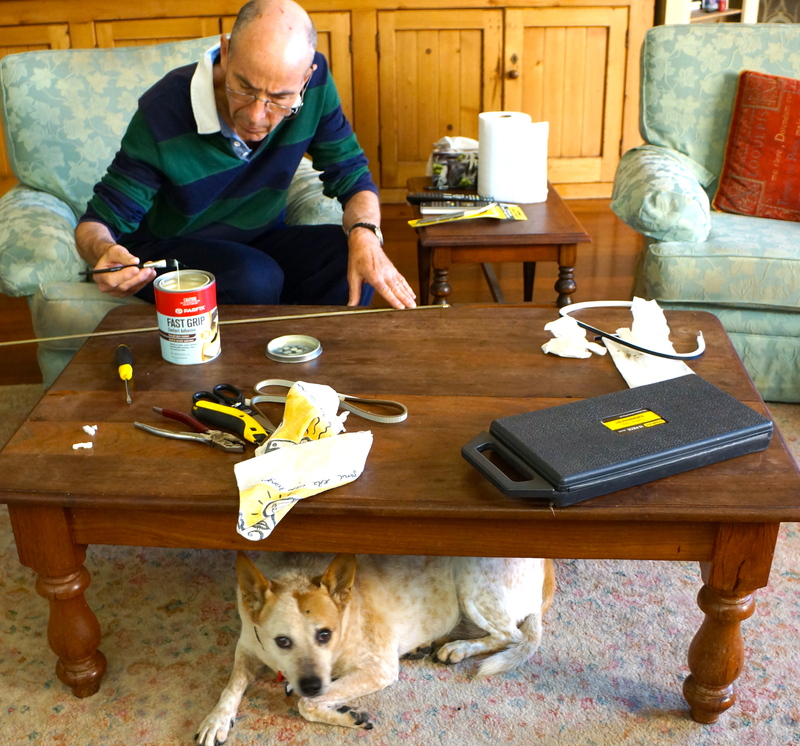 Please note: he is gluing on the coffee table! We then inserted the sponge bar, and voila! machine works perfectly again. I immediately set to work on a pair of socks for Mark. 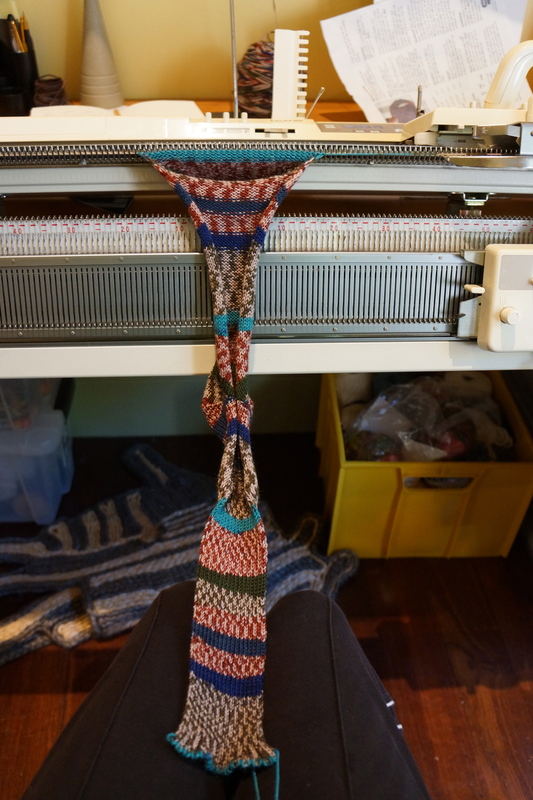 I wanted to check that I hadn’t lost my sock making mojo, so used some yarn from Spotlight. It’s not as soft as the cashmere, but it is very forgiving of bad treatment. 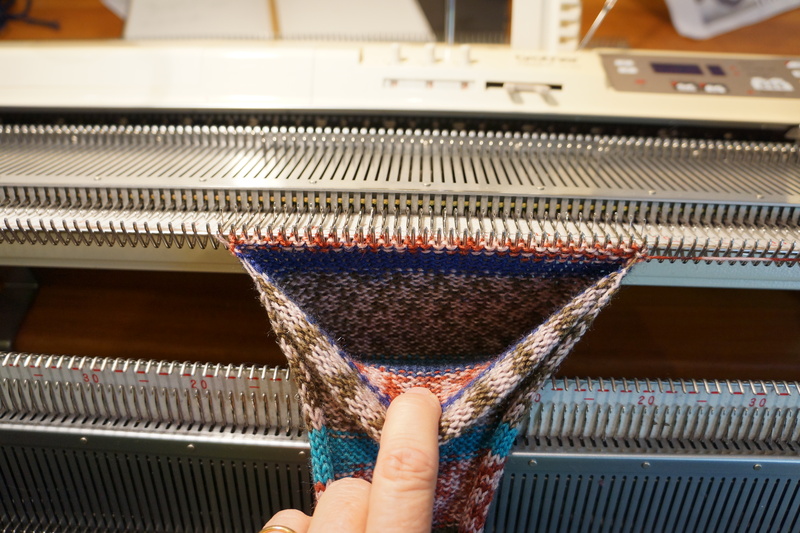 Then I turn the heel, knit the foot and turn the toe. 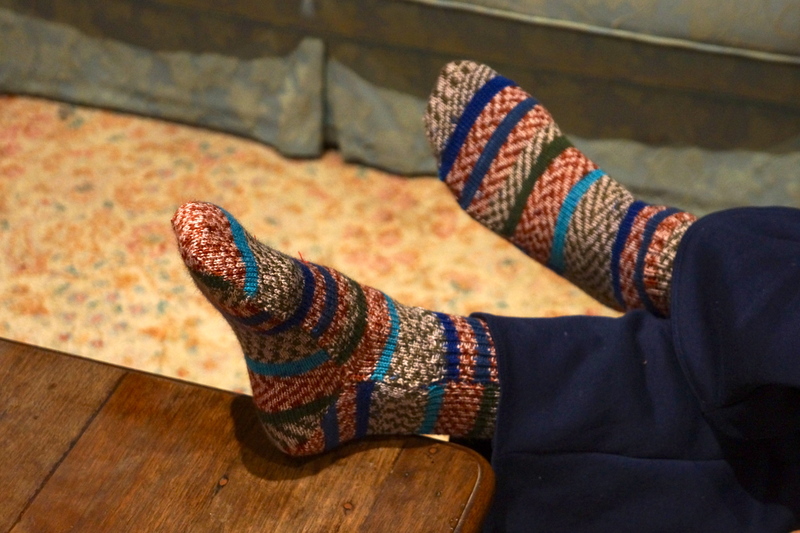 Once I have done this I knit back up the foot, giving me a pocket, which is the actual sock. Then I rib the other side. 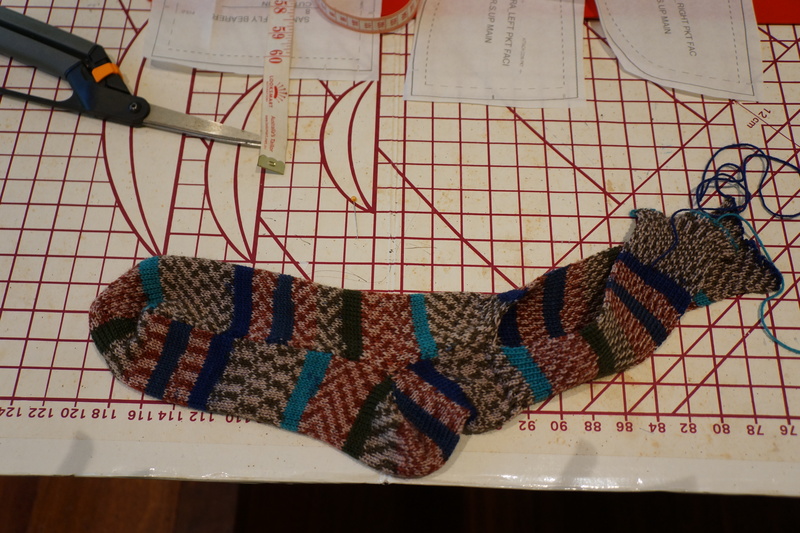 In about 20 minutes I have a sock, ready to have the ribbing sewn up. 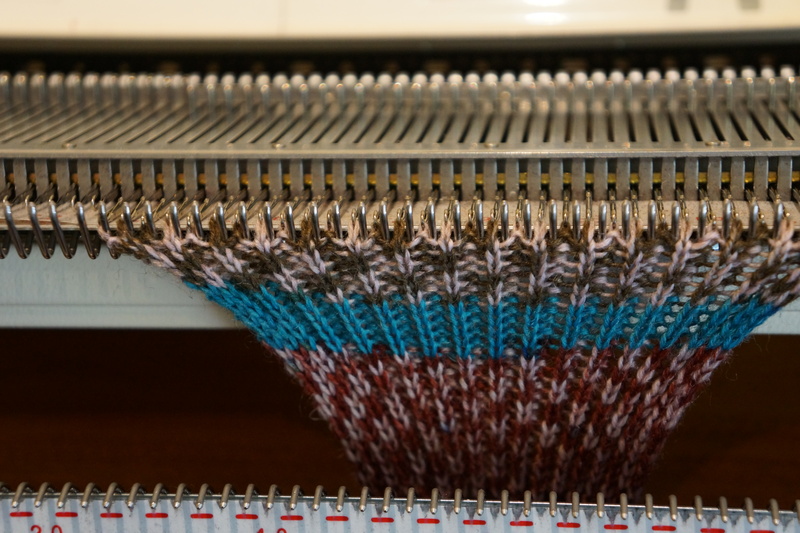 Because of the way they are knitted, none of the stripes or patterns match up. This does offend my sensibilities, but I decided, some time ago, to get over it! Then I stashbusted a pair for me. Same Spotlight yarn, but a couple of different colours in there. Mine are even quicker to make because they are considerably smaller. 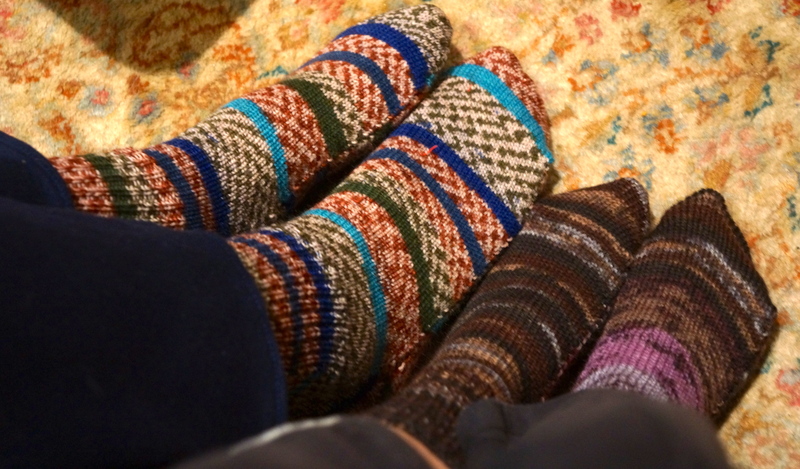 A quick sew up, and we have two pairs of socks and lots of toasty toes!